Bishop Robert T. Hoshibata preaches during worship on April 26 at the 2012 United Methodist General Conference in Tampa, Fla. A UMNS photo by Mike DuBose. "Can this love heal our United Methodist Church?" 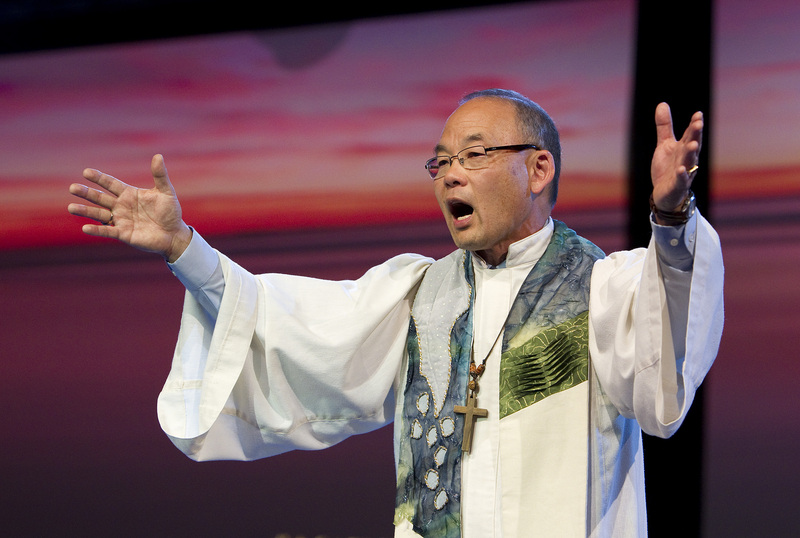 Bishop Robert T. Hoshibata asked General Conference 2012 as he preached in the evening worship service on April 26. The sermon, based on Mark 3:7-12, explored the healing love of Christ. While Jesus was known for his physical healing, Hoshibata considered how the ability of Christ's love to heal a person's soul could have a profound impact on individuals and the church as a whole. Stately, rich and calming renditions of "There Is a Balm in Gilead" by the Zielinski Singers from McFarlin Memorial United Methodist Church in Norman, Okla., and "Healer" by the National Choir of Côte d'Ivoire set the tone for the evening's theme of "Heal." As the service concluded, worship leaders invited congregants to share their needs for healing and to anoint and pray with each other. At the end, Hoshibata and several other bishops invited individuals to come forward for additional prayer and anointing with balm provided for all the delegates by JustPeace. Hoshibata's sermon noted the parallels to Christ's concern for physical and spiritual healing in the work of Methodism's founder John Wesley. Wesley was deeply concerned with physical health and, in 1747, wrote the text "Primitive Physick" or "An Easy and Natural Method of Curing Most Disease." Hoshibata noted that Wesley also cared deeply about the health of a person's soul and encouraged asking, "How is it with your soul?" during the class meetings he instituted. For Hoshibata, Christ's soul-healing love can also affect the denomination. Amidst the challenges and conflicts in the church, he said, access to Christ's healing love is a privilege available to all. However, he said later, "We need to determine to be part of God's healing love." "We may say that we are people of deep faith, but if we do not live out that faith by reaching out to everyone in Christ's love, then we are, in the words of I Corinthians, nothing but a noisy gong or a clanging cymbal." Hoshibata challenged to his listeners: "Imagine a church for all God's children, intentionally opening its heart, mind and doors to everyone - everyone! Where disciples of Jesus Christ proclaim and practice acceptance of all - of all others - without regard for who they are, what they look like or whom they love. That's a church&ellipsis; that's a church&ellipsis; that's a church that is healed of mistrust and fear." Offering a vision of the church reaching out to communities, the hungry, the homeless and the marginalized, he concluded the church he sees is a church "that knows that love heals." This was Hoshibata's first opportunity to address the full General Conference since his election to the episcopacy in 2004. Since his election, he has served the Portland Episcopal area and the Oregon-Idaho conference.